Today, nearly 40 students from two high schools of Hamburg presented their results within a one-day workshop in Berlin. During the last year, together with scientists from the Competence Center ASCT, they developed solutions for traffic problems like air and noise pollution or traffic congestion. 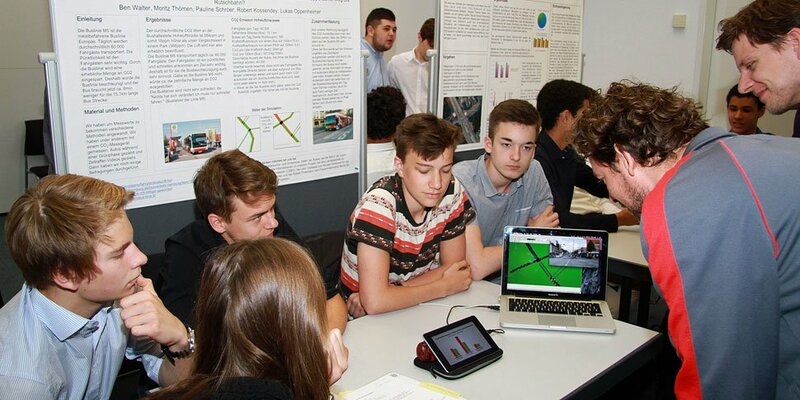 For one year, the students from the Helene Lange high school and the high school Kaiser Friedrich Ufer did research on nine traffic optimizing topics under guidance of ASCT. In this framework, they collected local data of noise levels, traffic flow and CO2 concentration. With these data, the students simulated various traffic scenarios using the program SUMO. Subsequently, they developed solutions for different scenarios including the Hamburg Stadtbahn (city railway), the parking garage of the Elbe shopping center and the traffic in Altona-Mitte, the new district of Hamburg. Similarly to a professional research projects, the students passed through all of the important working steps: from a project proposal via the evolution of a research question through to the timetable and the final presentation. Fraunhofer FOKUS cooperates with the Hamburg high school for the third time. The collaboration will be continued next year. Beyond, ASCT participates in various other events for students like the “Lange Nacht der Wissenschaften” and the Girls’ Day.